Additional note….in some parts of Canada ( and I’m from Nova Scotia) Mother’s Day is also referred to as Christian Family Sunday. This started in the mid 1960’s. Also, we wear either a white carnation for a deceased Mum or a red or pink one for a living Mum. If a person was more affluent, maybe a rose, but I can remember making many carnations from dual layer Kleenex and a twist tie. Just a bit of cultural difference….and Happy Mother’s Day to everyone. Bev S, this is really interesting. What a lovely way to pay tribute to your moms. I’m also from Nova Scotia (and have lived in New Brunswick, Ontario and Quebec) and I have never, ever heard Mother’s Day referred to as “Christian Family Sunday.” I think you’d be extremely hard pressed to find it used anywhere outside of a Protestant church (or related church group, website, etc.). It is definitely not something I have ever heard anyone say in casual conversation, on the radio, in a store, etc. Thailand celebrates Her Majesty the Queen’s Birthday as Mother’s Day as she is the mother of the country. August 12th is a national holiday here. Father’s Day is celebrated on His Majesty the King’s Birthday, which is December 5th. Some religious groups celebrate Mothering Sunday, as well as Mothers Day. So there are two celebrations. For Mothering Sunday we used to give the mothers a white flower during the church service. (We were Christians back then.) There were no gifts or anything like that. Mothers Day was celebrated at home and was very strictly for mothers only. We did not do anything at school for Mothers Day, because some children did not have mothers. 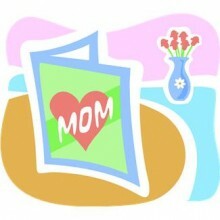 I do not remember ever having a special meal or doing anything special for Mothers Day in those days. I think there must be some very sad mothers this year in Nigeria where the girls have been kidnapped and the boys were incinerated recently. Our community has a massive charity event to raise money for breast cancer research every Mothers Day. It’s a sort of Fun Run. People are also encouraged to donate the money they might otherwise have spent on a gift. It is better to have a live mother with no gift than a dead one. Louise, I had never heard of Mothering Sunday before. Hope all had a Happy Mothers day. In Italy, and other parts of Europe, they celebrate Women’s Day in March, which I think is nice – an acknowledgement that whether women are moms or not, they should be celebrated! Sprigs of yellow flowers are given to women of all ages on that day. I was in Florence for Women’s Day this year, and in my hotel room was a corsage for me to wear that day. It made me feel so special. Janice, thank you for telling us about Italy’s Women’s Day and also for telling us about your Glass Bead Mystery Series.